Kung fu tea, not tea or tea to the name of the class, but a cooking tea techniques.Is called kungfu tea, because this way of making tea is very exquisite, operate requires some effort, kung fu is the knowledge of making and drinking of kung fu, did not have a good time is not a bubble good tea. Taste the kunfu tea is best where there is no wind, home is the best, of course. Finally put the classical music, there is quite a different refined. 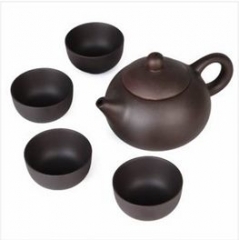 Purple clay teapots are well-known.Yixing's brown earth pottery is made of a peculiar kind of local red clay. Also, because purple sand soup pot of purple sand rich in iron, which can decompose in the food fat, lower cholesterol levels. Note clay is not purple in color.